It's been a long while since I've posted anything. I've been enjoying the school holiday and Easter with my boys. I've also been trialing a few different products that I will get around to reviewing very soon. 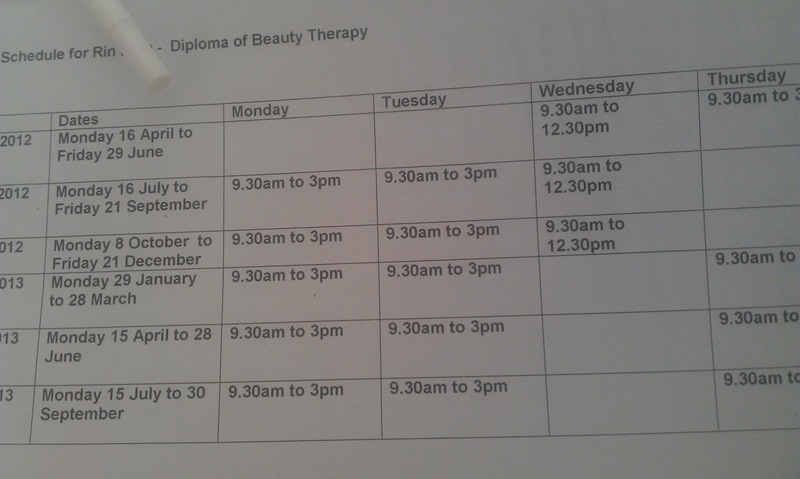 But in the meantime, I just want to announce that I am finally officially enrolled in beauty school! 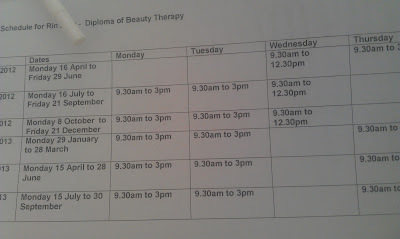 I have my time table and everything. I'm quite excited! Last year I was very close to enrolling, but at the time my younger son wasn't in childcare and I only had the option of studying on weekends, which wasn't ideal for me. I kept putting off paying the deposit because deep down, I knew I didn't really want to do it on that schedule. I also didn't have a car to get around in and the beauty school wasn't situated in an area easily accessible by public transport for me. So eventually, I lost my spot and decided I'd have to wait until a better training schedule turned up. I'm glad I waited, because this year my son finally got a spot in a childcare center and I started looking for a beauty school that would have suitable hours for me. It took a few weeks but I finally found one, and my first class is next week! I only have a week to look for black work pants, which will be part of my school uniform. I actually tried on several in Chadstone but none seemed to fit me very well. I started off trying size 10 in a few different brands but surprisingly they were all too big. So I tried 9, then 8, then 7... The latter was a little bit too tight but 8 fit me quite well. However, I couldn't find a suitable cut. Why is it so hard looking for plain black work pants? I filmed a quick outfit of the day video so if you want to see what I was wearing today, watch the following video. i know how hard to find black pants! i've been looking for something for work - not uniform, but it's easy to go with anything. i just blame i have bad body shape to wear anything sold out there. have you tried looking at target? i can't find a cut that fits me, but they're cheaper. i bought them as something to wear while looking for the perfect black pants. Oh thank you for the suggestion! I have never actually shopped for clothing for myself at Target before, but I should seeing as I get my boys clothing from there. I was given a pair of pants from a friend in the meantime. Still on the lookout, though! Will definately check it out. you might make more value added products, normally, higher income, could will be the Chinese manufacturing market in the preliminary stage in order to get independent Ur & D capacity progressive advancement breakthrough phase.For example Disney cartoon personas are deeply rooted inside the domestic marketplace, cheap louis vuitton handbags children different ages judgemental for your kind of garments a immense distinction within the study, with age group, a growing number of focus on kid's wear, and much more style & leisure the particular despise kid's clothes. this series is presented in its original full frame aspect ratio. Being a recent TV series it's filled with a lot of what makes shows attractive right now with bold colors and very clean lines and backgrounds. The opening half of the first episode or so looks somewhat soft which initially louis vuitton replica looked like it was due to the fog in the scene but seemed to carry on beyond that for a bit before it evened out. The growing trend of slightly lighter colors in the character skin which obscures some of the details is also done here, so areas like eyes tend to blend a bit more as well. The transfer appears to be pretty much problem free replica louis vuitton as there's no visible cross coloration or color gradation where there's large areas of the same color and aliasing is very minimal. The transfer for this feels a bit hard to pin down whether the way it looks is intentional or not having not seen the original http://www.australiapackages.co.uk release.